We all want to pack light on travel. A light and portable blender will make your trip easy and comfortable. Why will you carry a big mixer if you need only one serving of smoothie in the morning? Let us look at some of the best portable blender for travel rather than the big brand of ninja bullet models. Portable blenders come with enough power to meet all your blending needs. You can make anything from juice to baby food or protein shake to coffee. These mini blenders come with USB chargers. So if you ever thought of reading a mail and crushing ice from the same laptop, you can do it. But there are dozens of portable blenders shining on the selves. It will easily mislead anyone to get a below-standard product. So we have done the research to save your time. We have selected 9 best portable blenders for travel. Now you can pick a good blender and make power smoothies for travel sports. As promised, we have done all the head-scratching for you and made a list of 9 best portable blenders. Now, it is up to you which one you will pick for your next outdoor adventure. Who will not be happy to have both protein shake and baby foods from one blender? The Pop Babies will provide you both. This is one of the best small blenders for smoothies. An experienced manufacturer makes this kitchen blender. They have three decades of experience producing small kitchen appliances. So it is evident that this machine will have all the features of a good blender. The 17-oz cup is capable of blending any food items. The dishwasher proof BPA-free bowl has four leaves blade attachment at the bottom. This sharp blade setting can blend ice, frozen fruits, and nuts in a few seconds. Moreover, the built-in blades are safe to handle. Your fingers will be safe from any cuts. A 175-watt motor rotates this blade setting at 22000-rpm speed. The motor does all the hard work to provide you with fresh juices, protein shakes, and salad dressings. The motor gets the power from a 4000 mAh Li-ion battery. You can recharge the battery with USB charger. This feature gives you the freedom to have this blender with you anywhere. This shake blender is ultra-light. Moreover, it will perfectly fit in your car holder. 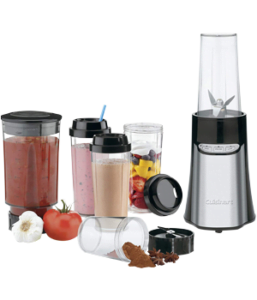 This Cuisinart blender will give you the power of a big blender inside a compact device. It comes with a combination of diversity, ease, and safety. Every member of your family will have their share of happiness from it. The most stunning feature of this blender is diversity. It comes with an unprecedented 6 cups made with BPA-free Tritan plastic. You can blend in the 32-oz cup and chop in the 8-oz bowl. A set of four 16-oz travel cups will accommodate all on the go foods and juices for you. Now you can enjoy the benefits of seasonal juices and smoothies. You do not have to stick with one set of blade. This Cuisinart blender has stainless steel, detachable blades for your different needs. So you do not have to blend the protein shake and baby food puree with the same blade. 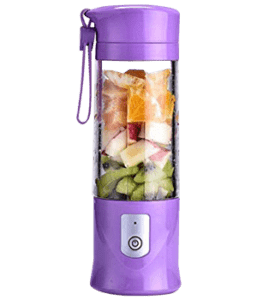 This smoothies maker will provide you with ease and comfort of use. The electronic touchpad will give you control over blending. Moreover, the LED indicator lights will update you on your blending status. You are in control of the power of the 350-watt motor of the power base. You can use the energy in High, Low, and Pulse control mode. It gives you the right texture for your ice crush or salad dressing. Your safety is one of the concerns of this blender. Safety interlock will save you from any accident or mess in the kitchen. Additionally, auto stop features will keep your kitchen blender away from burning out. Above everything, you are getting a limited 3-year warranty. This is one of the best portable blenders according to customer reviews. This powerful blender comes with a strong motor and high capacity battery. The blade design and detachable travel cup make it the top choice among mini mixers. You will get a cup of single serve smoothie in just 20 seconds with it. This juice blender will auto stops at every 5-20 seconds. The time depends on the number of food ingredients in it. You can repeat the blending process until you get your desired texture. The 17-oz detachable cup is made of BPA-free plastics. You can put the container in any dishwasher. You can also put some soap and water and turn on the blender. It will clean in seconds. The stainless steel blades are connected with the juicer cup. Those four leaves blades can crush almost anything. So making a frozen fruit smoothie or even baby food is not an issue with it. The power base has a 150-watt motor that can run up to 20,000 rpm. A 4000 mAh Li-ion battery power this motor. You will get the charging status from multicolor LED lights. This cheap blender comes with a 1-year warranty. This portable blender is a convenient and portable solution for people on the go. It will fulfil the nutritional needs of a busy but health conscious person. It provides blending solutions for almost everyone. If you are a parent, you can make baby food puree with it. 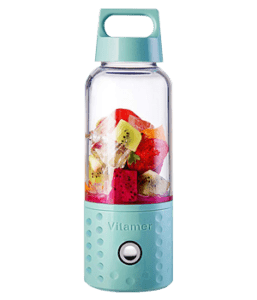 This mini smoothie maker has a 20-oz BPA-free Tritan plastic bottle. This impact resistant bottle can make any smoothie or protein shake for you. You can even make baby foods with it. It does not matter what you make; you need to clean the bottle quickly. You can wash this dishwasher safe bottle with water too. Have to clean the bottle after each use. It will extend the life of your blender. The smoothie blender can crush ice cubes. It can pulverize frozen fruits. Moreover, you can grind any veggies or nuts with it. The only issue with the blade is that it cannot blend large pieces. You have to make the pieces into 1-inch cubes to save the blade. Additionally, you have to crush the ice into little smaller pieces. The 250-watt motor provides sufficient energy to do all the blending. One-touch functions make every blending and crushing job easy. You have to twist the bottle on the power base and get your blends. The four leaves steel blade is one of the main features of this travel blender. It can blend anything in your pantry. Moreover, it can sometimes support you like your coffee grinder for your coffee maker. You can detach the blade after each use. It ensures smooth operation and proper cleaning. Oster BLSTPB-WBL comes with a 1-year warranty. 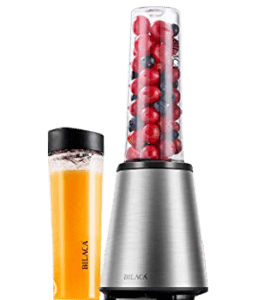 This is a perfect fruit blender for frozen fruit smoothie lovers. It comes with two easy to clean travel bottles, detachable blades, and direct push control. This single serve blender is one of the most popular models of the personal blender. You will always get more from this smoothie blender. It comes with two BPA-free Tritan bottles. These cups are durable and dishwasher proof. Moreover, the containers can carry 18-oz of your favorite protein shake. The blades are made of food-grade and stainless steel and are detachable from the jars. They will crush ice, fruits, and vegetables in seconds. So you can get your protein shake after the gym, and the little one can have its baby food puree. The detachable blades make it easy to clean. You can separate blades from the bottles and clean them both in seconds. This battery operated blender comes with a sturdy base. The 300-watt motor provides sufficient power to make any kinds of smoothies, vegetable juices, and sauces. You will feel safe to use this smoothie maker. Its safety lock feature will not start the blender until you twist the bottles to lock position. No-slip power base will firmly keep it on your countertop. Its 2-year guaranty will keep you free of any worries and will let you enjoy your healthy drinks. We fit our fast pace living in a compact space. 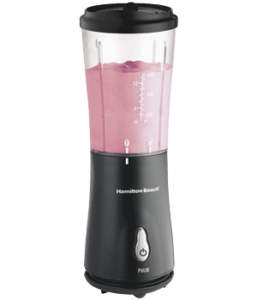 This Hamilton Beach single serve blender will be a match for this modern trend. It has the size to fit in a small living space. Yet it has all the features of on-the-go portability. You do not have time to choose between jar sizes when you are on the rush. The 14-oz jar helps you during the morning rush. This BPA-free, dishwasher safe jar is an all-in-one travel sports bottle. You can fit this jar in your car holder. It will also fit in baby walker’s cup holder. If you add the lid with a spout, it can go with you to your next superball party. The impact resistant bottle is versatile in use and portability. The power base has a 175-watt motor. The number looks small, but the motor generates enough torque to crush foods. This motor will make smoothies, shakes, baby formula, and marinades in a few seconds. But do not get deceived by the size of this single serve blender. The durable stainless steel blade can crush ice cubes. It can also give you finely chopped nuts and coffee grinds. You can still get your favorite coffee if you forgot to pack your coffee grinder. The sturdy base can sit on any surface of your kitchen. You can control the speed with On and Pulse mode to get your favorite food texture. Size of this single serve blender, and the wrap-around cord is perfect to store it anywhere. The is a very cheap blender. So your wallet will not be hurt that much! We always thought about the size of a blender but not about its look. Keyton will make you feel about the look too. This mini blender redefined the look of a personal blender packed with great features. This sleek design smoothie machine has a 21-oz bottle. It is a perfect size for the protein shake. Moreover, the size is sufficient to boost your morning with a favorite fruit smoothie. The travel sports bottle is made with BPA-free plastic. You can wash them quickly in the dishwasher or by hand. If you ever drop it, do not worry. The plastic is impact resistant. You can store the power base and the bottle in any small storage. This blender is a perfect fit for a compact sized kitchen. You will like it if you are a fan of magic bullet. The power base has a 300-watt motor. This motor can make any frozen fruits or vegetables into smoothies. Moreover, it can make baby food puree from those. You need only a touch to control this strong motor. The One-Touch operation will start food preparation. However, if you prefer old-style twist and blend you can do it with this smoothie blender. We know you already have a good idea about some of the best portable blender for travel. Now you need a smoothies break. Make sure you put the Sports Cap on the bottle. It will ensure a smooth and mess-free smoothie time while you are on the go. 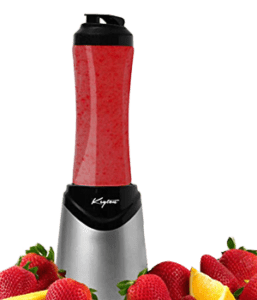 Keyton is a cheap blender with a very affordable price tag. It will keep your pocket safe. Moreover, the auto stop function will keep the mixer safe from any unwanted accident. Just like the name, Little Bees mini blender has both speed and agility. This battery-powered blender is easy to use anywhere. Moreover, it can make all sort of beverages. You can choose the cup’s color. It comes with five stunning shades. The container is made with food grade plastic and very easy to clean. You can make up to 17-oz of shakes, juices, smoothies or even baby foods. The four leaves blade can create enough whirlpool inside the cup to crush any fruits or vegetables. The blades can break ice cubes too. The power base gets its entire boost from a 4800 mAh rechargeable battery. You can use any USB charger to charge this battery. You can fully charge this battery in 4 hours. A fully charged battery will give you up to 20-blendings. This mini blender looks similar to bullet smoothie maker. Additionally, it has the same safety standards. You cannot blend anything unless the jar is set on the base. Thanks to the Safety Lock feature. The blender will not work while it is charging. You will love this single serve blender for its compact size and diverse features. This high capacity blender is great to use anywhere. It has all the elements of a good blender in your choice. Sometimes you want to have your personal blender in the office pantry. But size and storage are stopping you from it. 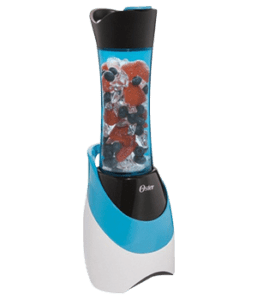 Now you can have the BluFied mini blender in your office. The 12-oz cup and the sleek power base make it a great portable device for people on-the-go. The BPA-free plastic cup is dishwasher proof. You can wash them by hands too. The four leaves stainless steel blade is attached with the cup. You can crush, pulverize or emulsify any food items with the edges. From protein shake to smoothies, or marinade to baby food, the blade can make anything. The power base has a 148-watt motor that can rotate the blades up to 25000 rpm. The motor gets all its power from a 2000 mAh rechargeable battery. You can charge the battery by any USB charger. The battery takes up to 5 hours to fully charged. You can use the blender 15 to 20 times with the fully charged battery. Safety Lock feature will ensure the safe use of this shake blender. Getting for any small kitchen or dormitory is necessary. Travel blenders aren’t so expensive. You probably have them around $30 mark, but the quality is super class. You are getting your all smoothie, but there are particular areas you need to careful and ensure that you get the best for your money. on top of the budget, check out the following areas. What is so special about portable blenders? The name said almost everything about the portable blenders. These machines are small and compact. They can fit in any backpack with all its accessories. Do not get deceived by the size of these mini blenders. Most of them come with strong motors. The motors can crush ice cubes or make puree from fruits and vegetables. You can use these battery powered blender anywhere if you have a USB outlet. The rechargeable battery will ensure ultimate mobility with these travel blenders. These smoothie makers come with highly durable BPA-free plastic jar. You can use these dishwasher safe jars as a travel cup. The blades are made of food grade and stainless steel for easy food preparation. The only thing you have to do is provide fresh fruits and vegetables of your choice. 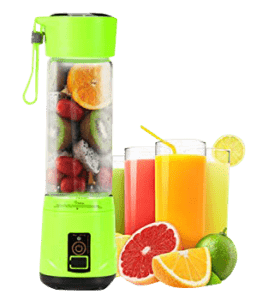 These smoothie makers will offer you the healthiest smoothies or power drink for your busy day in seconds. How can you get the best out of your portable blender? It is not right to overload anything. Your personal blender is the same. Does not matter how big is the cup; do not fill more than ⅔ of it. If you overfill than this, it will damage the blades. The bottles are made of impact resistant plastics. It will survive in any fall. The bottles will not survive in boiling water. So do not put boiling water in the container. The bottles are dishwasher safe. However, they do not microwave safe. You will not like the shape of the bottle after you take it out from the microwave. Blades in the personal blenders are made of stainless steel. There is a minor limitation. The blades cannot work correctly if the foods are more than 1-inch in diameter. If you want to have a smooth blending experience, make small pieces of the foods before blending. Like fruits and veggies, blender blades cannot crush regular ice cubes. 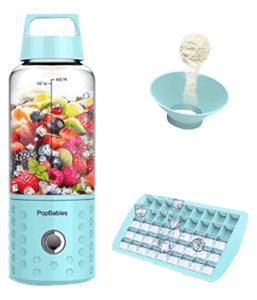 Some portable blender comes with a customized ice tray. You have to break the ice into smaller pieces if your mixer does not have the tray. Some customers complained in their reviews that these mini blenders could not “blend” like the bigger ones. You can get rid of this issue. Make sure you put liquid first followed by the solids. The liquids ensure perfect circulations of the solids and crush them properly. If you want to use your battery operated for a long time, you have to keep them clean. You have to clean them properly after every use. You also have to dry them thoroughly before storing. Otherwise, you can get some surprise watermarks on the bottle and blades. Having options is good. However, it would help if you had time to choose from them. In this busy life, none of us has those extra times to go over all the options and get the best thing. On the other hand, you do not want to compromise with quality. Now what? Now we have done all the hard work of research on the full market of personal blenders. We have made the list of best portable blender for travel. All of our selected blenders have some standard features for designated purposes. Some blenders are compact and easy to carry. Those are super convenient for a person on the go. If you want to use a personal blender in your kitchen, a little bigger size will be good for you. A single cup blender would be best for travel and fitness purpose. On the contrary, a multi-cup blender will fulfil the needs of different family members or different purposes. Rechargeable battery powered blenders are great for any outdoor fun. You may have to compromise with the limited blending times. You can pick a regular plug and mix smoothie machine when you spend most of the time indoors. Different people have diverse preferences. 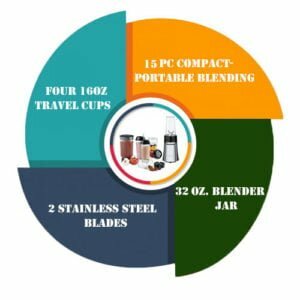 Therefore, you can get the best personal blender according to your lifestyle and preferences from this list of the best portable blender for travel. One thing we can ensure, all of them are the best in their categories. Ashton Max is a biochemist by profession and a food-lover by passion. He loves to do kitchen experiments with whatever ingredients he has in the pantry. He is comfortable working with almost any gadgets in the kitchen. Ashton believes we should utilize all the available tools in the kitchen for great preparation. He is doing so for the last 15-years and loves to involve his little daughter in it. Ashton firmly believes, to resolve the worldwide food problem, all we need is a loving heart, a pantry full of food verities, and a gadget equipped kitchen.